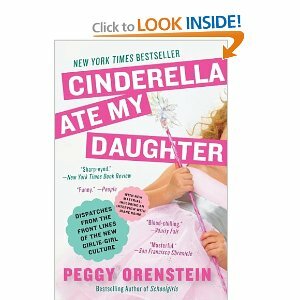 For the past two decades Peggy Orenstein has had her finger on the pulse of contemporary girl culture. The author of three acclaimed books on girlhood as well as a poignant memoir about her arduous journey to motherhood, Orenstein takes on mass marketing and the Disney machine in—Cinderella Ate My Daughter: Dispatches From the Front Lines of the New Girlie-Girl Culture—her latest book just published in paperback. Orenstein sends her dispatches from places as varied as toy fairs and the toddler-tiara pageant circuit. She doesn’t claim to be covering uncharted territory in these venues, but to be exploring these landscapes anew with a pink lens. For pink is the predominant color in this mega-industry of anointing Disney princesses and the glittery hoopla that comes with the coronation. How did this insanity begin? When did it escalate? Here’s the short answer. Parents and grandparents have bought the complete princess package. For starters, a Disney survey reported that parents equated the word princess with safe. Accordingly, Disney has created a world where an infant’s onesie announces her royal status. From there it goes on to elaborate costumes that emulate princesses from Cinderella to Tiana—the first African-American princess in the Disney lineup. Companies dip DVD players, cameras and the more standard purses and jewelry boxes in pink. Orenstein, the mother of 8 year-old Daisy, is personally on the frontlines of girl culture. Daisy occasionally appears in Cinderella Ate My Daughter and it seems she’s a wonderful chip off the old block. When a girl layered in pink—pink helmet, pink bicycle—challenges Daisy’s preference for a green dragon helmet and neutral colored bike, Daisy tells her that her choices work for boys and girls.